Tyburn Farm Winding Hole is a minor waterways place minor waterways place place on the waterways major waterways place village town city on the Stratford Canal (Northern Section) between Lapworth Wharf (7 miles and 1½ furlongs and 11 locks to the southeast) and King&apos;s Norton Junction (Junction of Stratford and Worcester and Birmingham Canals) (4 miles and 6½ furlongs and 1 lock to the west). The nearest place in the direction of Lapworth Wharf is Whitlocks End Farm Bridge No 10; 2 furlongs away. 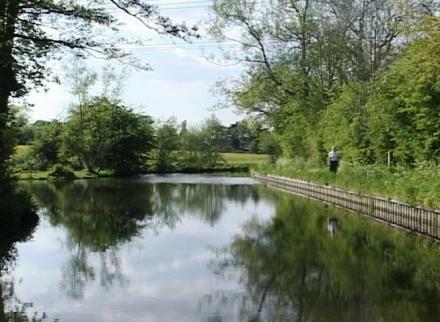 The nearest place in the direction of King&apos;s Norton Junction is Dicken&apos;s Heath Narrows; 1 furlong away. Solihull — 1496 yards to the east. 7 Three Corner Close, Solihull, B90 1DL — 560 yards to the northwest. 120 Main Street, Dickens Heath, B90 1UE — 1308 yards to the southeast. Solihull — 1529 yards to the southeast. 5, Beech Lane, Solihull, B90 1FW — 1377 yards to the south. Stretton Road, Shirley, Solihull, B90 2RL — 1265 yards to the northeast. Truemans Heath Riding School, Trueman's Heath Lane, Shirley, Solihull, B90 1PQ — 1438 yards to the west. 28 Main Street, Birmingham, SOLIHULL B90 1UA — 1158 yards to the southeast. Yulia Lisle OilArt studio: Hay Manor House, Old Dutch Barn, Trumeans Heath lane, Solihull, B90 1PG — 994 yards to the west. Light Hall School Hathaway Rd, Solihull, B90 2PZ — 1402 yards to the northeast. Solihull — 720 yards to the north. Bills Lane, Birmingham — 1206 yards to the northeast. Tythe Barn Lane, Solihull, B90 1 — 515 yards to the south. Haslucks Green Road, Birmingham, B90 2 — 1184 yards to the north. Tilehouse Lane, Solihull, B90 1 — 486 yards to the west. 75 Main Street, Solihull, B90 1UB — 1239 yards to the southeast. 28 Main Street, Solihull, B90 1UA — 1205 yards to the southeast. Apartment 12 Market Court, 61 Old Dickens Heath Road, Solihull, B90 1GL — 1088 yards to the southeast. Solihull — 1473 yards to the east. Solihull — 1565 yards to the southeast. Solihull — 1283 yards to the southeast. Solihull — 1078 yards to the north. Solihull — 1276 yards to the southeast. 20 Burman Road, Birmingham, B90 2BG — 1487 yards to the northeast. Tythe Barn Lane, Solihull, B901 — 252 yards to the south. Solihull — 512 yards to the southeast. 517 yards to the south. 20, Micklehill Drive,shirley, Solihull, B90 2PU — 1562 yards to the east. Tythe Barn Lane, Solihull, B90 1PH — 901 yards to the southeast. Main Street, Solihull, B90 1UB — 1194 yards to the southeast. Tilehouse Lane, Solihull, B90 1PN — 373 yards to the southwest. Tilehouse Lane, Solihull, B901 — 680 yards to the south. Hathaway Rd, Solihull, B90 2PZ — 1404 yards to the northeast. 1 Main St, Solihull, B90 1UB — 1156 yards to the southeast. Solihull, B90 1 — 1330 yards to the north. 643 yards to the southeast.